It has been a VERY long time since I have participated in the Sunday Salon, and while I would like to promise myself that this is the start of a weekly habit, I know my track record too well to make that commitment. This week marked the return to the routine. All the holiday decorations have been put away again for another 11 months, and the back-to-school regimen began in earnest. I have made good on a few resolutions, but I am trying not to overdo it. Slow and Steady wins the race is my new motto. This semester will be a drastic change in schedule for me. Without going into too many details, I asked and was granted a one semester sabbatical from teaching my most challenging course: 9th Grade English. I think the stress and strain of last year (having 9 different course preps, taking care of my ill mother, and eventually dealing with her death) has taken its toll on me. I have little patience, and in this particular classroom, I had none. But I am indeed so blessed to work for a caring and compassionate administrator who saw my need and was willing to fulfill my request. It took a while to find a suitable substitute, but at 4:00PM on Thursday afternoon — when classes were to begin at 8:30AM on Friday — a final decision had been made. I spent Friday early morning gathering course materials to hand over – and for the first time in my life I benefited from my OCD organizational tendencies! In just one hour I had assembled 90% of all the handouts and lesson plans that I believe she will need. In addition to that schedule change, my Tuesday/Thursday class dropped enrollment to just two students this semester. And as fate would have it — all of us have first hour free on Monday – Wednesday – Friday. So what this means for me is that I will be done teaching at 1:30PM on these days and I will have Tuesdays and Thursdays totally free. And my schedule on Fridays is amazing: I teach Brit Lit 2nd hour and 8th Grade English 5th hour. For the first time in the 8 years I have been teaching, I feel as though I can have a personal life during the school year – and I am so excited! So what do I plan to do with all this free time? Well, for one thing, I hope to blog more regularly. I hope to start maintaining a list of possible blog post ideas and then cull from that list on a weekly basis. I hope to develop an exercise routine that helps keep me fit. I am not looking to run any marathons or bulk up muscle mass. I just want to firm up the flab and walk several times a week. I hope to not only write my daily morning pages, but I want to begin to hone my writing craft. I tend to use 750words.com as a journal, documenting life events and personal feelings – but I do not give much thought as to how I write. I want to work on my creative writing projects on a regular basis. I hope to focus on photography as a creative means of escape. So far this week I have taken a picture every day for the 365 Project and I am glad to have persevered. However, the pictures are definitely more journalistic in that they document how I spent the day rather than creative expression. BUT…slow and steady wins the race and I have promised myself that I will enjoy the journey and not add undo pressure. 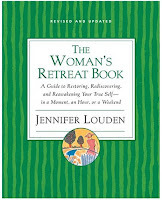 In order to help me complete the above resolutions, I read Women’s Retreat Book by Jennifer Louden. In that book she outlines some ways in which women can organize their own personal retreats that can last anywhere from a half-hour lunch break to a long weekend excursion. The greatest insight I learned from this book is that a retreat is purposeful. I have had plenty of days of alone time, but I tend to fritter the hours away. A retreat has structure – and intent. So my plan is to reserve Tuesdays for school work: lesson planning, outside reading for certification (the topic of another post), and grading – but Thursdays will be a day off. A day for intentional retreat or fun creative play. I hope to scrapbook some more (I really enjoyed Christmas recipe album project) – perhaps try quilting once again – schedule my own mini read-a-thons – or conduct a nature photo shoot. So while the end of the holidays is marked with a certain sadness that the celebration is over – for me, it is also the time for a fresh start. This week will be a full week of school – which is followed by a long weekend due to the Martin Luther King, Jr. holiday. For me, that will be a five day break and one in which I not waste away. I'm SO happy for you that you've been able to free up some personal time and really proud of you for asking for what you needed! Good job:) I could really learn from you on this one… And that book looks amazing – just emailed myself to pick up a library copy tomorrow – thanks for the tip! Sounds like you have some much needed downtime this year to get back in balance! I love your plan! Women generally aren't that good at taking time for ourselves. Good luck! How nice that your schedule has worked out so well. I think your plans sound wonderful. Also, don't think I've said, I love your new look. So fresh and pretty. Have a great week, Molly! How wonderful that you are going to be able to have more time for yourself this year! It is so easy to fritter away time, I need to be better about that! I'm so glad to see you with some time for yourself. Sounds like you have some sensible plans for filling that time, plus a great mantra of slow and steady. I've resolved to keep my teaching in the library spontaneous this year. I've also vowed to warm up each morning to ten minutes of praise music, thus combining movement with worship. I am glad you will be taking it a little bit easier this year, Molly. It sounds like everything is coming together nicely. Have a great New Year! I am so,so happy for you Molly. Your teaching schedule last year was insane and it is no wonder you are in need of a break. Congrats on your son's engagement too! I chuckled when you said he was getting married on New Year's Even as that is the day my son proposed to his lovely girl. We will have such great reasons to celebrate this year! Your teaching schedule sounds really good to me – so lovely for you to have two days off. Teaching English is something I imagine as very work intensive. For the students as well. My daughter is taking 8th grade advanced English and the homework is immense. She has already decided not to take Honors English in 9th grade – these kids need a life as well. After all they're only kids. Perhaps it's only her crazy school, I don't know. I have always loved "English" classes (it was German AND English in my case), but I also remember a lot of homework – although not quite as much as my daughter has today. And since I see that you're teaching similar grades I wonder – do you give a lot of homework? It would be interesting to see from a teacher's perspective. You almost never hear a story of someone's job getting LESS stressful so this is great! It will be a much-needed change in your hectic schedule. I almost heard your sigh of relief from down here! What a great semester you have coming up. Enjoy it. I love the idea of personal Thursday!